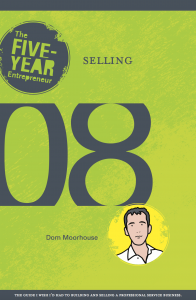 Following a series of posts from my Guide 08: Selling (see also: Common mistakes made in selling professional services), this blog looks at the basics of building a high-performing sales capability in your organisation. So, per my earlier blogs (example), you accept that a selling capability is fundamental to your future firm valuation; let’s turn now to what it takes to build a high-performing sales capability within a professional service business. Firstly, let’s be clear what we mean by ‘capability’ in this context. What I am aiming you towards – the nirvana end-state – is a place where you have a set of individuals with excellent sales habits and, further, the ‘multiplier’ effect of all these individuals working to a consistent, firm-wide method and tool-set. The title figure above captures this. If you are reading this as the singleton owner-manager (or your firm is still very small) then you have a huge advantage. It is far easier to build these habits and processes (and embed these tools) in a small team; thereafter, new joiners to your business can be easily inducted into the ‘way we do things around here’. As such, I strongly commend anyone in this early-stage maturity to tackle this challenge immediately. Conversely, the longer you leave it – and the larger the firm – the tougher a climb it becomes. Regardless, as this is such a critical endeavour, I also strongly commend you to run this as a specific project with fulsome investment from the firm’s leadership. This, in full acknowledgement of the time, effort, cost and continual leadership-presence required to be successful. None of what I am about to tell you is particularly complicated; it does, however, require a lot of hard miles to be trod. If it were easy, every firm would have a great sales engine and be growing like topsy. It is not easy. The key point I am making here concerns the appropriate prioritisation and scoping of this exercise. You do not solve the issue by commissioning one-or-two sales training days assuming all will come good from there. It takes real leadership commitment, a focused, unrelenting approach and many, many months before you affect any enduring change in this area. So, you see this is a multi-dimensional pursuit. At its foundation, individual members of your firm need to develop the self-confidence and motivations required to be successful. This has to start with you as their leader. There are a million-and-one (false) rationalisations invoked as to why now is not the right time to get involved in selling. To a degree, it is the natural starting mindset. Most people, after all, enter the entrepreneurship arena as technical experts in their field and have little, or no, sales experience. This attitudinal point has to be overcome first. But, even well-motivated staff are not effective until they also have the requisite skills (as visibly demonstrated by their firm’s leaders) and a structured process to follow. So, building this capability involves designing, embedding and continuously refining these core methods. Before we get into this, let me describe the key elements of this method in overview as per the figure below. Firstly, selling is very distinct from the activity of marketing (this will be covered in a separate blog series). If marketing is about brand development and lead generation, selling is about the conversion of leads-to-contacts-to-clients (and maintaining excellent relationships thereafter). The two aspects clearly work ‘hand in glove’ but to merge them together (as many do) is to miss the very unique challenges of each – and, therefore, to court failure. Selling can be broken down into two key sub-areas – the acquisition of new clients and the management of existing clients towards further work. The colloquial terms ‘hunting’ and ‘farming’ are often used to capture these activities respectively. I will talk about techniques for both and the relative effort weighting that should be applied to each. At the heart of a disciplined sales method lies a pipeline-based forecasting and management process. At the wide, open end of this ‘funnel’ you will have all the many leads that are being generated by your marketing activity and your own individual research. At the other, far narrower end, you will have clients putting fresh signature to the latest contract. Pipeline management is about progressing this conversion with maximum efficiency (moving towards optimal conversion ratios and a shorter lead-to-contract time lag). Specifically, I am going to introduce the concept of managing two separate, but closely related, pipelines. One will track your relationships with prospective clients in recognition that selling, fundamentally, is a human process involving the search for, and dialogue-build with, the ultimate client decision maker. This pipeline is calibrated by time-to-contract; that is your estimate as to how long it is going to take to get to the sold work point. Key techniques within this journey include how best to handle an initial introductory chat (say, at a conference or in the proverbial ‘lift conversation’), how best to handle an initial conversation and how to maximise success from a sales meeting. The second pipeline is that of specific opportunities that arise from your relationships with prospective clients (in the people pipeline) or as a result of unsolicited invitations to tender (ITT). This pipeline is calibrated by your estimate of likely probability of winning the work, which, along with a size of contract estimate, is the core input into your forward revenue pipeline view. Key techniques involved here are the qualification process (is it worth your time/effort to pitch for the work?) and, of course, advice on writing winning proposals. The more significant the opportunity, the more time you need to spend in analysing the prospective client’s requirements, the competition and your differentiation in order to craft the optimal set of selling activities. All of this – account planning – will be touched on as it pertains to gaining new clients and, importantly, the ongoing development of existing relationships and business. So, with plenty to cover, future posts will get into the detail. I should say, up front, that there is no shortage of advice in this area. indeed, when we put our collective heads together at Moorhouse to design our own methodology, we each pulled out reams of material we had collected from our previous careers at ‘Big’ professional service firms. Be it ‘Spin Selling’, Miller Heiman’s coloured sheets or a large firm’s tailored process, we drowned in the stuff. Of course, there was plenty of sound advice in amongst all this but we all shared a sense of previously working into sales regimes that were over-engineered, burdensome and where you just could not ‘see the wood for the trees’. My caution then is to make any such sales method (including the one I am about to outline) your own by selective pruning and design. Keep it as simple as possible to be useful but not stifling. As I have said before, what is simple is understood and what is understood has a fighting chance of being followed. The real unrelenting focus should be on improving your colleagues’ attitude and self-motivation towards selling (the core issue), not on the production of a huge sales process manual.